The root API class for performing Boolean Operations on arbitrary shapes. For Boolean operation COMMON the arguments can have any dimension. For Boolean operation SECTION the arguments can be of any type. BOPAlgo_AlertBOPNotSet - in case the type of Boolean Operation is not set. Constructor with precomputed intersections of arguments. Constructor to perform Boolean operation on only two arguments. Obsolete. 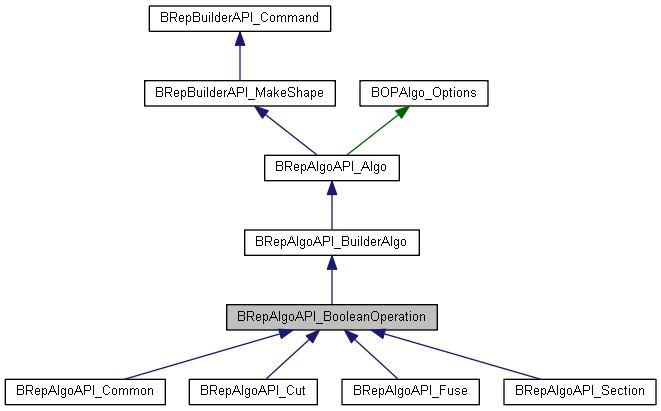 Constructor to perform Boolean operation on only two arguments with precomputed intersection results. Obsolete. Returns the type of Boolean Operation. Sets the type of Boolean operation. Returns the first argument involved in this Boolean operation. Obsolete. Returns the second argument involved in this Boolean operation. Obsolete.